Today’s generation of young people in the region still lack the information, services and supportive environment to prevent HIV transmission. Each year on May 17 people across the globe join together to commemorate International Day against Homophobia and Transphobia (IDAHOT). The Day draws attention of policymakers, opinion leaders, the public and the media to the stigma and discrimination experienced by LGBTI people around the world. 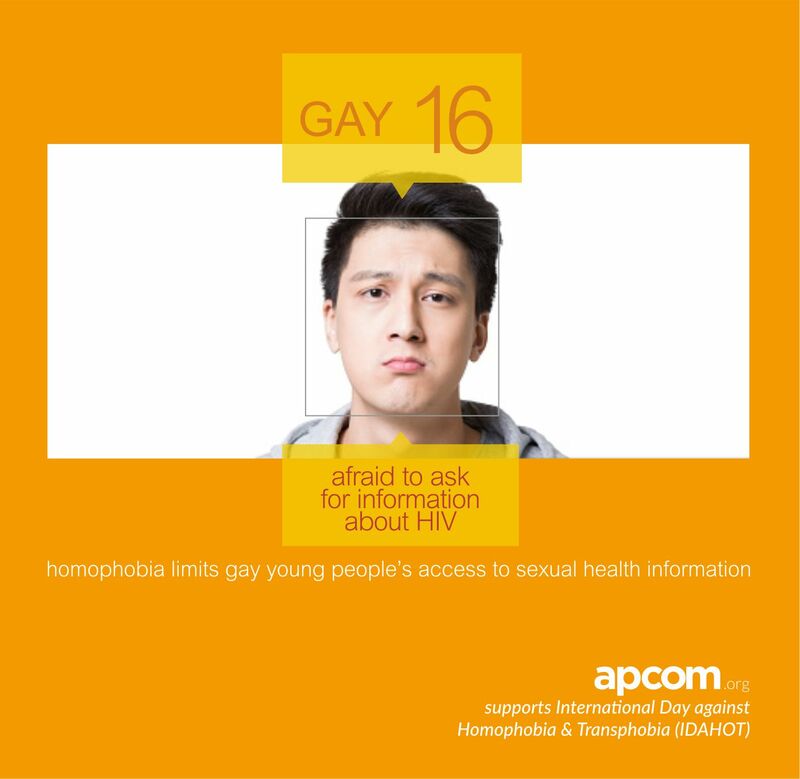 This year’s IDAHOT theme emphasise on young LGBT people. Join and support IDAHO Committee and IGLYO’s Thunderclap campaign– a social media flashmob that aims to ensure LGBTI young people inclusion. Today’s generation of young people in the region still lack the information, services and supportive environment to prevent HIV transmission. According to UNAIDS 2012 estimates, approximately 58,000 new HIV infections occurred in young people aged 10-19 in Asia-Pacific region. Devastatingly, many of these were among gay and transgender young people. 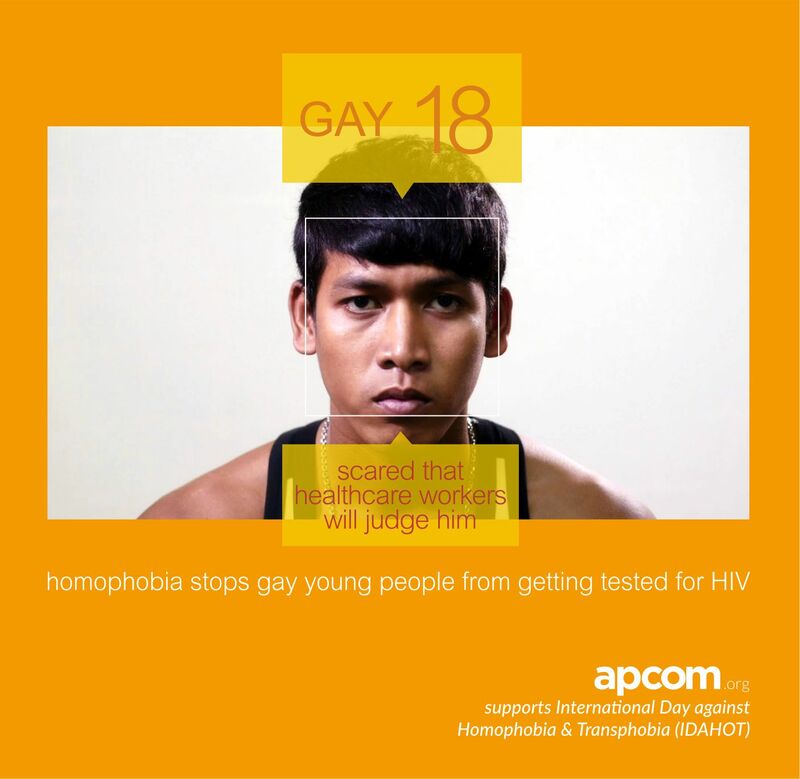 According to Jumping Hurdles, a discussion paper produced by Youth Voices Count (YVC) and APCOM, the high prevalence of HIV among young MSM and transgender people in the region is due to the rampant homophobia and transphobia HIV, which for many LGBT young people in the region, starts at home. Consequently, their ability to access vital information regarding HIV and sexual health is curtailed. A study from UNESCO suggests that HIV knowledge levels, including how to prevent HIV infection, are distressingly low among young people in the region. In Bangladesh and Indonesia, less than 20% of young men can identify prevention measures correctly. While specific data regarding HIV knowledge among young key populations is unavailable, it is indicative that the knowledge among gay and transgender young people is far more upsetting than their heterosexual counterpart. “I always avoid the talk regarding sexual health, at home or at school. I’m scared that the talk will go further to giving me a question whether I like boy or girl,” said David, a young gay man living in Malaysia who thinks his surrounding is too conservative to accept who he really is. Even when these young people understand the importance of HIV testing, many are frightened to access services. They fear of having their sexual orientation and/or gender identity being disclosed to their family without consent as well as of being judged and ridiculed by the medical staffs. According to a study conducted in Beijing, 40% of the young MSM who had never previously tested for HIV refused to take the test due to fear of being stigmatized for homosexuality. Similar case is evident among young transgender people as well. Across the region few young trans women step forward for HIV testing. In Pakistan, only 4% of trans women took HIV test over a 12 month period in 2010, according to AIDS Accountability International study. “I was told to sort out my gender when I came to the clinic to get tested. Like many other transgender sisters here in Fiji, I decided to avoid using healthcare services. They don’t understand and respect gender diversity,“ said a young transgender woman in Fiji. 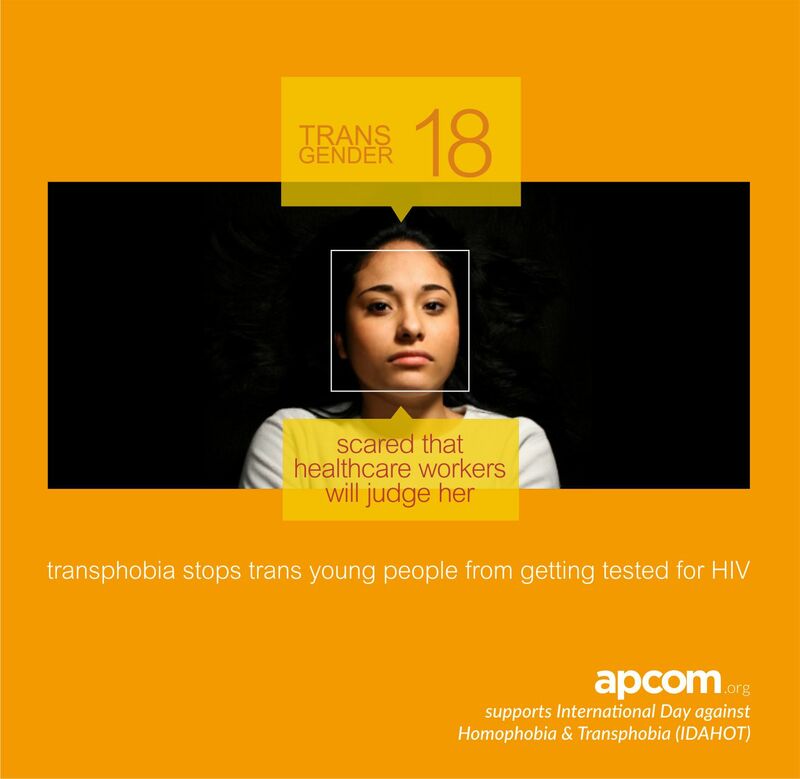 Homophobia and transphobia propagate hostile HIV test counselling for LGBT young people. 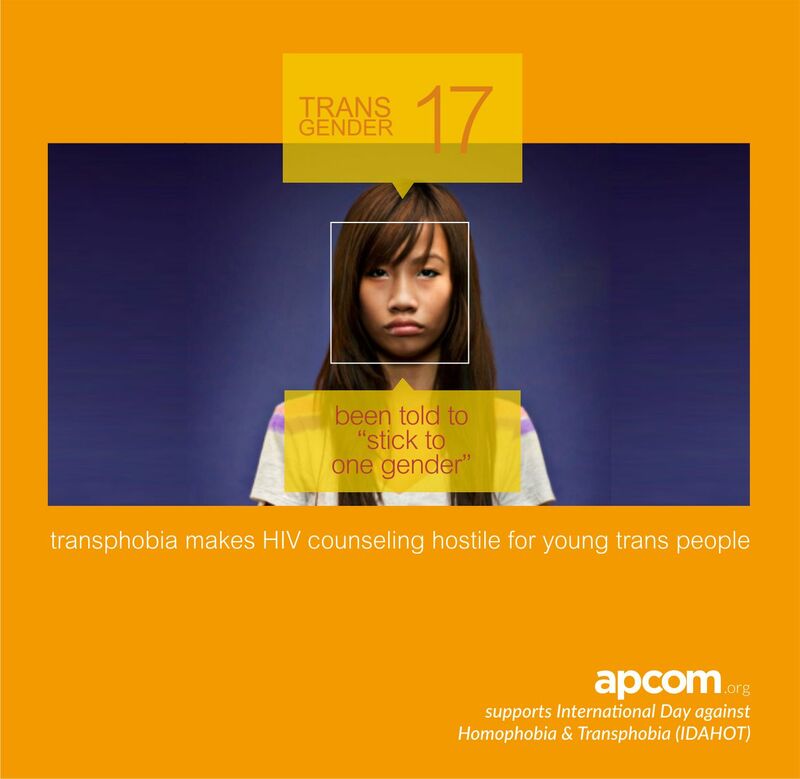 In clinics or testing sites where the counsellors are homophobic and/or transphobic, LGBT young people may be given counseling that includes corrective measures against their sexual orientation and gender identity, as opposed to receiving support and resources for their specific health needs. Not only will this traumatize them, but also decrease their willingness to enter into HIV continuum of care. International Day against Homophobia and Transphobia serves as a reminder that we must work together to reduce stigma and discrimination, and continue to advocate for the health and human rights of LGBT communities. No longer should gay and transgender young people face constant challenges when attempting to access HIV prevention interventions.